College football hasn't seen many players quite like Josh Allen. 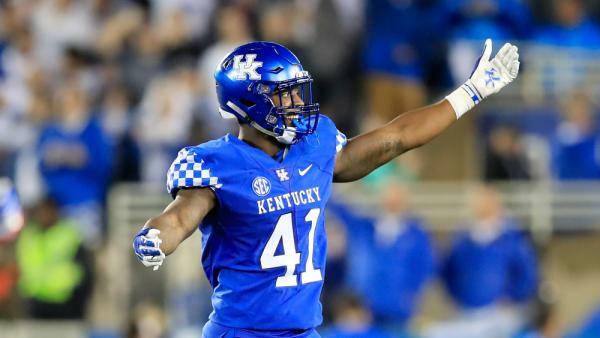 Kentucky's Josh Allen is college football's best defender. The 6'5'', 260-pound talent, who is now being projected as a top ten prospect for the NFL Draft, leads a unit currently tied with Clemson for number one in the country in scoring defense. Recently displayed on billboards in Times Square and soon-to-be showcased in a top ten division title bout with Georgia, Allen has the Wildcats one win away from from their first-ever SEC Championship Game. His place in history is already reserved. Setting the tone for Kentucky's defensive charge, Allen ranks number two nationally with ten sacks, fourth with 14.5 tackles for loss and first with five forced fumbles, pacing the league in each category. He, beyond just a dynamic playmaker off the edge, also slots in the top five in the SEC in solo tackles with 35. For point of reference, Allen has the same number of sacks as Georgia, as many passes broken up as Greedy Williams and is one strip away from the league's career forced fumbles mark. Allen is the only player this millennium with at least 55 tackles, ten sacks and five forced fumbles eight games into a season. The impact Allen has made on the Kentucky defense has been overwhelming. In addition to allowing a college football-low 13 points per game, the Wildcats rank 10th in total defense, 5th in redzone defense and only Washington has given up fewer plays of 40 yards or more. Kentucky is surrenduring merely 4.59 yards per offensive snap, the second-best rate in the SEC. No team has scored over 20 points on the Wildcats; remarkably, no league foe has scored over 16 in regulation. Kentucky's defense, most recently, shut down record-setting Missouri quarterback Drew Lock, limiting the star signal caller to less than 170 passing yards and without a touchdown for only the second time in his upperclassman career. The Wildcats joined Alabama as the lone teams this fall to hold the Tigers to less than 250 yards of total offense. Allen compiled a team-high eleven tackles, two sacks and a pair of forced fumbles. As Kentucky rallied to a dramatic 15-14 victory, Missouri did not record a single first down in the second half. The national focus, before the start of basketball season, is now on Lexington. Fittingly, Allen will be directly in the spotlight in one of the Wildcats' biggest home games ever. With a triumph over defending national runner-up Georgia, Kentucky would represent the east in the SEC Championship Game. Should the Wildcats, 9th in the initial College Football Playoff Rankings, win out, they would advance to a different type of final four. In Allen and running back Benny Snell, Kentucky has two of the premier players in the country. Both deserve to be part of the Heisman Trophy conversation. Snell, with 935 rushing yards and nine touchdowns, and Allen, as the top defensive playmaker in the game, have led the Wildcats to the national forefront. Entering November, there is at least a hint of bronze in the bluegrass. College football hasn't seen many players quite like Allen. The front-runner for multiple national awards, Allen is a leading name in the game. His team is furthering the trend.